One of the most famous landmarks in the world is the over 300 meter tall iron structure gracing the skyline of Paris, the Eiffel Tower. 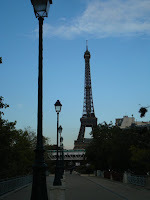 Built by Gustave Eiffel it was first opened in 1889 for the World's Fair. The structure was the largest building in the world until 1929 when the Chrysler Building was erected in New York City. There are three levels that visitors can access, each one costing a bit more of course. One the first level, there is a new restaurant and shops as well as a post office. On the second level is the four star restaurant, Jules Verne. The first level can be accessed by climbing stairs or taking an elevator. The third level is only accessible by an elevator. 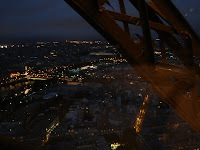 We splurged on a dinner at the Jules Verne Restaurant one night of our stay. It was elegant and of course the view was spectacular. They have a sampling menu that you can get for 200 euros each and two people at the table must order it. We opted to order ala carte. Passing up the "entrees" which in France are appetizers, we each chose a main course. I had sea bass and Bob ordered lamb shoulder. We also p assed on dessert. However, we each received mini-appetizers of a bean curd with chicken soup on top and complimentary sweets after dinner. 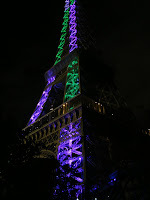 During dinner, the tower sparkled on the hour with its light display. When we finished dinner, after a short walk around the observation deck, we descended to the street to watch the light display at the next hour. It continues for about 20 minutes and is best viewed from the bridge over the Seine that is in front of it. Beware of the traffic there. There is a major traffic jam each hour. On our second pass through Paris as our riverboat arrived in the city at the end of our cruise on the Seine from La Havre, we had a great view of the tower from our berth on the river. 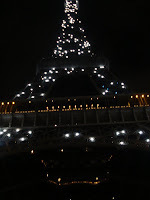 With one more trip to view the lights at night, we bid farewell to Paris.